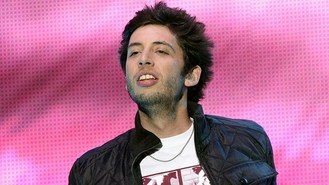 The singer, real name Elliot Gleave, is releasing his third studio album, The Evolution Of Man, later this year. He said: "It's still unmistakablely me - people aren't going to be shocked or scared by it, it's just got a lot more guitars on it and it sounds a lot more epic and maybe a bit more grown-up but also a bit meaner in places. "Because of the guitars, a lot of it is influenced by grunge and heavy metal. But it's not a metal album or a grunge album, I'm well aware of who my fan base is and what they want." Example admitted the album took shape after a period of soul-searching. "Last year I split up with my girlfriend and was single for about six months and I kind of worked out what I wanted to do with my life and who I wanted to be. "Some blokes do it at 21, some blokes do it at 30, some do it at 40. I turned 30 and decided maybe it's time to grow up and stop behaving like an idiot, so I did and I wrote all about it." Four tracks on the album, including upcoming single Say Nothing, feature guitar-playing by Blur's Graham Coxon. "He's an absolute legend. I just met him a couple of times and very cheekily said, 'Will you play guitar on my album?' It was a lot easier than I expected." And the singer, who has just released details of his new 2013 arena tour, confessed that his tour rider was very modest. "All we ask for is quality ham and cheese... It's really not that exciting. We don't want to make stupid demands," he said.